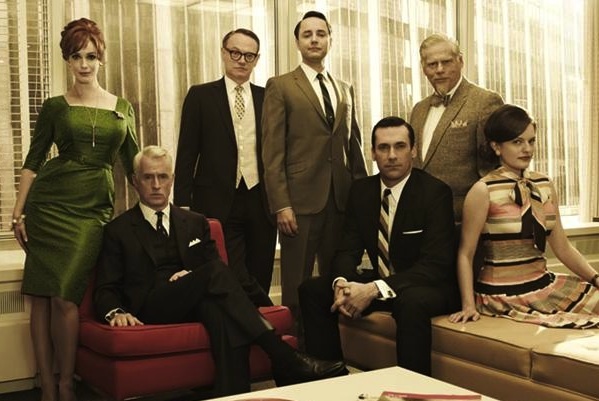 Characters battled illusion, each other and the changing times as Mad Men offered up a triumphant return. When we last checked in with Mad Men (a year and a half ago! ), Don was left in the wake of a whirlwind engagement to his secretary, Joan had found herself pregnant with Roger’s baby after one night of passion, Peggy’s new account had brought her less applause than she might have desired, and almost nobody was truly happy. In last night’s season five premiere of the Emmy-winning drama, creator Matt Weiner explored each character’s response to that nagging sense of discontent. Whether through defiance, resignation, or bargaining, each of the primary figures on the show engaged in his or her own game of managed expectations and was rewarded with mixed results. And just outside their Madison Avenue offices, the vibrancy of the civil rights movement began to press itself into everyone’s frame of consciousness. Despite his long-standing efforts to keep his personal and professional lives cleanly separated, Don found himself the victim of a surprise birthday party that sullied his home, embarrassed him in front of his co-workers, and made things tense between Don and Megan (who, so far, blends affection and strength much more skillfully than did Don’s ex-wife, Betty). Don’s gala was a spirited romp for all but the birthday boy — a man who, at least for now, seems to have steered away from his heavy drinking and womanizing and has eased into the more reliable pleasantries of domestication. And why shouldn’t he? Megan loves Don, is great with his kids, tolerates (most of) his moodiness and satisfies his sexual appetite. But what does Roger want? Relevance, for one thing. As one of the aging figureheads of the ad agency, he’s been delivering far fewer clients than Pete and is on the fast track to becoming a sharply-dressed fossil. Throughout the episode, Roger directed his energies not at actually getting any work accomplished, but at affirming his own declining dominance at the firm. Pete, meanwhile, bristled at Roger’s habit of shouldering in on his meetings uninvited and eventually insisted on taking Roger’s office for himself. Roger scored a small victory, however, by bribing (and then threatening) Harry until Harry gave his own office to Pete. It was a desperate delay-of-game from Mr. Sterling that did not sit well with Pete and probably sowed all manner of conflict for future episodes. Peggy didn’t have much to be pleased about, either. After her big, artsy pitch to Heinz (a bean ballet, no less) was unceremoniously deflated by an unappreciative client, she found herself saddled with a heavy weekend workload and with nothing but Don’s birth to celebrate. Since Don’s married life has rendered him disinterested in anything resembling work, some of Peggy’s resentment about the Heinz project spilled out toward Megan and even toward Don himself. And in a brief but terrific subplot, Lane discovered a wallet in a taxi and, upon calling its owner, sparked a quietly harbored lust for a woman he’d never even met. His bittersweet story, like so many other wistful threads in this remarkable premiere, reinforced the episode’s theme of the cruel intrusion of reality on a brighter and less-inhibited fantasy. Here’s hoping that our own reality will include several episodes as strong as this one.